The following discussion and analysis looks at two equity hedge funds that specialise in the financial sector. Naturally the sector was stressed as the nexus of the Credit Crunch, and the dislocations within the sector have created gross opportunities which have been taken advantage of by both the funds covered here. The longer-established Tosca Fund has undergone a successful reorganisation in order to align the portfolio processes with investors' requirements. So, to be clear, the portfolio construction elements discussed here relate to the Tosca Fund after the reorganisation of the final quarter of 2008. One of the tenets of my consultancy business is that the portfolio construction and risk management used by a hedge fund should be consistent with the desired outcomes. The target returns are usually given as a range of absolute return per year, and sometimes come with a volatility of monthly return co-target or secondary target. The ranking of return versus risk assumption, whether it is volatility of return, downside risk, semi-variance, drawdown or worst monthly loss forecast is a primary element in understanding a particular hedge fund. Not just ex-post external measurement of risk versus actual monthly returns, but ex-ante from the perspective of the portfolio manager(s). What are they trying to achieve in terms of secondary risk characteristics other than absolute return, and how important are the higher moments in how they impinge on the investment process? I have been looking at two hedge funds operating in the same speciality, and looking through their portfolio construction techniques. Both funds are financial sector specialists. Naturally, both the funds have had different portfolio shapes in the last 18 months than in the previous period. The Tosca Fund set up by Martin Hughes and now managed by Johnny de la Hay is a long/short global equity fund which is run with fund shape drawn from Hughes' experience at Tiger Management. Tiger cubs tend to have a net long bias, but to always have a significant short book. The shorts are there to make money more than hedge. The net varies between +30 to +50%. The gross used to be typically above a hundred and fifty percent of equity; the gross of Tosca Fund has been closer to 100% of equity this year. Tosca is a net-long bias, directional, and fundamentally-driven hedge fund. ABACO Financials Fund is self-described by the managers as a market-neutral equity fund. It is of critical importance that that label market-neutral is at the first level of description along with the dedication to financials. For Inigo Lecubarri, Louis Rivera-Camino, and Martin Deurell who run the fund the beta-based market-neutrality encompasses a net between 20% net long and 20% net short. Striving to achieve relative performance within the portfolio, shorts are in place to hedge much more than for profit. A typical gross exposure (not average) has been, say, 190 percent of equity. A year ago the gross was less than 100% of equity, and is now back to the typical levels. So the ABACO Financials Fund has had a structurally constrained and smaller net exposure to markets than Toscafund, and a slightly larger gross through its life. The gross exposure of the ABACO product is thought to be nearly twice that of Tosca Fund at the moment. The ABACO Financials Fund is a structurally market-neutral, very slightly directional equity hedge fund in which returns come from both fundamental investing and trading. Not that Tosca doesn't trade around positions at all, rather trading has not historically been a major contributor to overall returns. Tosca is not a pure financials fund. The top-down parts of the process includes a macro-economic analysis and micro-level analysis (firm and sector level) which gives an understanding of the growth prospects of various product categories. Whilst the core of this work is about the financial sector, inevitably the prospects of the financial sector as a buyer or seller of products and services becomes evident. So Toscafund invests in service sector stocks which the fundamental research process on the financial sector suggests will have a tailwind (longs) or headwind (shorts). For example, moves to a cashless, lower cheque utilisation banking sector drives demand for other forms of payment processing and transaction methods. The beneficiaries may be software or hardware providers. ABACO is a pure financials hedge fund, with only a few positions being from outside Europe. The top-down elements of the ABACO investment process, the medium-term idea generation component, are very similar in outcome to those at Tosca. The knowledge base of the ABACO managers allows them to isolate the fundamental drivers for each sector and stock in their universe of more than 250 names. Drivers are of three classifications –a) Operational, b) Sector / Industry, and c) Macro-Economic. Companies financial performance is modelled based on the relevant drivers on the understanding that there is a trade-off between explanatory power and complexity. So for each company followed at Abaco the managers calculate an earnings sensitivity per factor. Earnings under various economic/sector scenarios can then be extrapolated, and then probabilities attached to the scenarios. So for the top-down (longer time-frame) element both Tosca and ABACO are using a thematic approach. This means that in effect stock positions in the respective portfolios are knowingly related to a degree. The ABACO Financials Fund is managed with multiple time-frames as ABACO always has trading positions as well as core investments. The Tosca Fund is managed with a much greater bias to the medium term, and in hedge fund terms one could even suggest a long-term time frame. The Tosca process derives a target price based on internal analysis extending out two years or more. In the short term the stock market resembles a beauty pageant, and in the long term a weighing machine. The Tosca approach assesses the companies' worth on a rational multi-year basis (weighing machine basis) and looks through the fashionable or commonly held subjective biases. This can be very powerful in allowing the manager of Tosca to argue with the short term perceptions in the market, and hold onto positions. Historically Tosca would tend not to use stops on positions or the whole portfolio, having taken a fundamental position on a stock. from research (Inigo Lecubarri),portfolio management (Rivera-Camino) and from a trading background (Martin Deurell). Capital is allocated as a function of expected risk/return and catalysts, the latter acting as triggers for timing. So the core of the process is a creating an orderly ranking of long/short candidates. Candidates for inclusion are assessed for their marginal contribution to portfolio diversification before they are added. Both Tosca and ABACO use a correlation matrix of names in their universe to understand the relationships between their holdings (and potential holdings) on a historic basis. Both Funds pay attention to the liquidity of positions – for Tosca Fund it must be feasible to liquidate 90% of the portfolio within three months of normal trading. In practise all but 10% of the current Tosca portfolio could be liquidated in 5 days on 20% of the market volume. For the ABACO fund at least 80% of the portfolio can be liquidated in less than a day's trading, and the balance of the portfolio can be liquidated in 2 to 3 days' trading. There are two factors at play here – size and style. The Tosca Fund is more than $2.5bn in AUM, up to 20 times the size of the ABACO Financials Fund. As important is that the medium to long term holding period of the Tosca Fund is matched by fund liquidity terms of quarterly redemptions with 3 months notice. The ABACO Financials Fund has monthly dealing and it has a trading component as well as investment time-frame positions. So the liquidity demanded of the underlying positions of the ABACO fund is consistent with the style, just as it is for Tosca Fund. Martin Deurell of ABACO has commented: "We are much more liquid (than Tosca) which can help us to execute the risk management efficiently. The drawback of this, of course, is that we can't capture certain alpha that Tosca can: they can take bigger positions in less liquid companies." 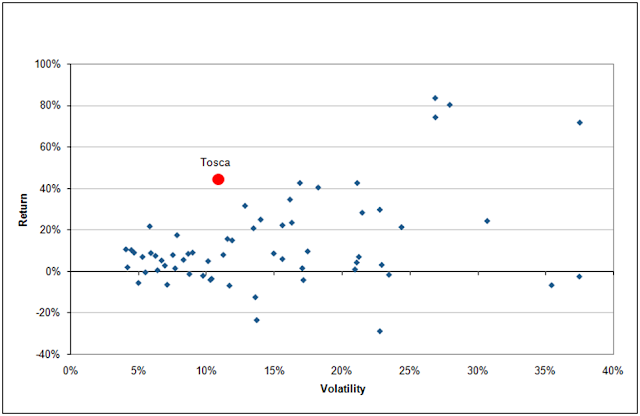 As mentioned, a differentiator of ABACO versus Tosca is that the former explicitly run trading (short term) positions. Allocations of capital to trading positions vary through time, as does the P&L versus the medium term holdings. So there is an element of diversification by book for the ABACO Fund. One further difference to emphasise between the two financial specialists is that, consistent with a market-neutral mandate, the ABACO Fund is described by the managers as a relative value fund. The long book is conceptually held versus the short book as it is at Tosca, but at ABACO the long and short books will be more similar. When a long position is put on by ABACO it is likely that a couple of short positions will be put on to minimise country and sector factors for the long. So for the same return target the ABACO fund structure would require a bigger gross. Having written that however, the Tosca Fund (a global financials fund) is much more diversified by country exposure than the ABACO Financials Fund. Maybe it is appropriate as European financial specialists that ABACO has more concentrated country risk. It is clear too that both fund managers spend a lot of time analysing and ranking country growth and credit worthiness, so the thematic top-down element is at least partly about expressing country biases. It is worth pointing too that Tosca Fund takes an active view on emerging market exposures – over a market cycle this should contribute to both risk and return relative to a fund that only invests in developed markets. In terms of the activity levels, from all of the above one could infer that the holding period of Tosca Fund is a lot longer than that of the ABACO Financials Fund, and that names turnover a lot quicker at ABACO. It doesn't mean that the research effort is more or less intense at either; it is just applied differently. So on balance the manager of Tosca Fund is trying to extract alpha over a longer time-frame than the managers of the ABACO Financials Fund, and given the larger bias to fundamentals has been more prepared to argue with the markets. Tosca Fund is net-long biased; ABACO Financials Fund is a market-neutral relative value fund. The target return of Tosca Fund is 15-20% net to investors over a full cycle - something it has achieved historically for most of its existence. I believe it will be achieved in future. The target return for ABACO Financials Fund is 10%, and just about as important to the managers is the lack of correlation to markets. The Tosca Fund was up 43% in 2009, the fifth time it has posted annual returns in excess of 20% since its inception in late 2000. The ABACO Financials Fund has had an annualized return since inception in June 2003 of 8.69% ($ version) achieved with a monthly volatility (annualised) of 5.99%, and is having its best year yet in 2009. However, given the mandate, it is just as significant that the returns of the ABACO Fund have an r2 of 0.01 with the S&P500, according to a hedge fund database. Further the return series for ABACO has a negative correlation with other hedge fund equity market neutral funds, at least at the hedge fund index level. The Fund also shows nearly no correlation with the European financial sector time series. The top down processes and risk measurements used by the managers of the two financial equity hedge funds are similar. The risk management and portfolio construction of the two hedge funds are different, but each consistent with their respective sources of alpha and targets for return, and explicit (ABACO)and implicit (Tosca) higher moments of their return series. Investors in hedge funds should always evaluate the extent that the portfolio construction and particularly the money management element of running a hedge fund is consistent with the form and time-frame of insight into markets utilised by a manager. In these two cases they are.